I have several music folders, and have created some playlists of tracks within those folders but not across them. Thinking that my playlists were somehow corrupted, I deleted them all and ran Full Rescan, then reconstructed my playlists. This did not fix the issue. I can find no controls that might be causing this new behavior. I await your suggestions. Could you provide the screenshot where we see that shuffle is off ? Can be found on the main playing screen. 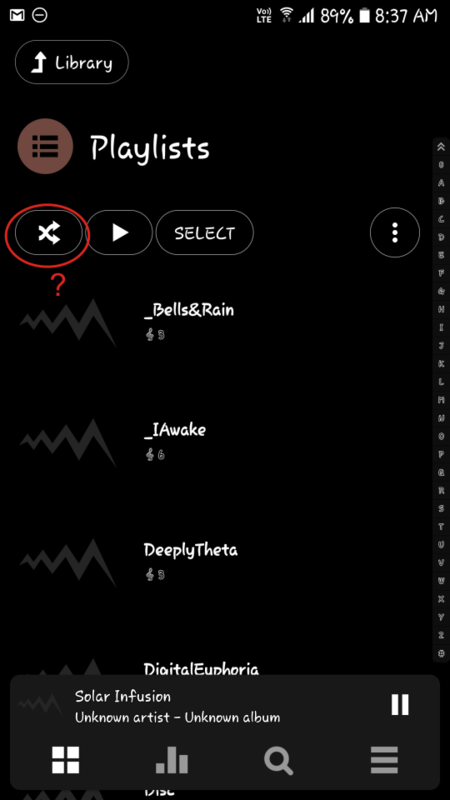 Also, could you check that you have not added anything to the Queue, as that is designed to take over from regular playback at the end of the currently playing song, and will do so until all of the queued tracks have been completed. 1. I open a playlist and tap the first entry. It plays to the end. 2. The player jumps to a random track in another folder. Expected: Player to play the second track in the playlist. There are no other tracks in the queue. If I manually return to the playlist and tap the second entry, it plays to the end and the player then plays the remaining tracks in playlist sequence. If I manually queue the tracks in the playlist, they are played as expected, in the sequence of the playlist. A screenshot of your shuffle options would, ok might, help. My screens look just exactly like this. Shuffle ticked OFF, Ignore Shuffle ON. 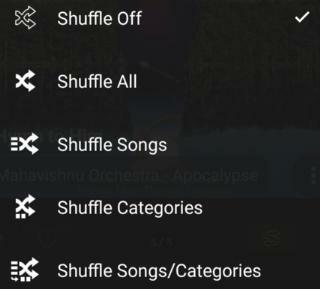 And as I showed you, there is an active "Shuffle All" at the top of the screen when I go to the Playlist library, which I would not expect to be there. This being active doesn't mean that you're shuffling but that you can press the button to start shuffling. It's known that this isn't consistent with the way the shuffle button on the main playing screen works. @Maxmp announced that he intends to adapt this. Any suggestions? I uninstalled the app, hoping that would clear all the settings, but re-installation shows my existing playlists. Maybe the settings are cleared, maybe not. What's needed for a really *clean* uninstall/rebuild? Completely remove the directory Android/data/com._maxmpz after deinstalling Poweramp. If the playlists are file-based then remove them wherever they are. Thank you! I've rooted my device, so that should be straightforward. I'll try that and then re-install. The playlists are the app's, not the system's. Strange, this does still sound like something is enqueued. Library > Queue does show as empty doesn't it? The Shuffle icon at the top of any of the library screens is a simple button, not an 'active-option' indicator. Tapping it should launch the currently viewed list in shuffled mode. I uninstalled the app and deleted the folder I found for it. Re-installing. WLYK what happens. Reinstalled, and even though I thought I deleted my playlist files in the filesystem, they're still here. I don't even see Queue as an item under Library, actually. Wow. TY... the queue was full of stuff. Cleared it, now let me see if the player behaves. Wow. TY... the queue was full of stuff. You must have turned visibility of the Queue off at some point, as I'm pretty sure it is shown as one of the default entries in the top Library view. As I mentioned earlier, I suspect that having unplayed items in the queue will be the cause of what you are experiencing. If you want to uninstall and clear all retained settings by the way, delete the folder /Android/data/_com.maxmpz.audioplayer/ (note the underscore) and/or use Clear Data in your device's app management page. 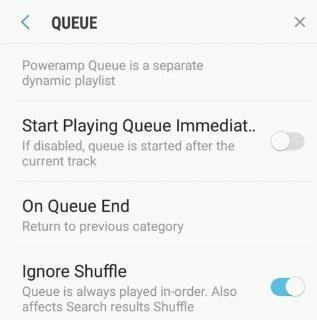 Any playlists that are saved as .M3U files on your device will be reloaded when you re-install, plus any Android system playlists that happen to exist on your device will be imported to Poweramp internal playlists as part of the setup process.